They arrived at Turtle Rock Farm Friday evening for supper, spent the night and were geared-to-go right after breakfast Saturday morning – these four, who had made a huge decision: to build turnable composters rather than sit in front of a television and watch the OU-Texas football game. Their decision was even huger than that, actually. They have committed to helping the soil: turning kitchen scraps, grass clippings, manure and other brown and green stuffs into compost for their gardens. 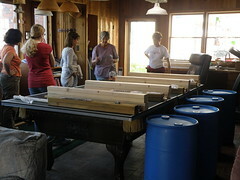 It was a great day, cutting and drilling and turning 30-gallon drums into turnable composters. Great work. Great community. Great satisfaction. Great help to Earth. THIS LOOKS LIKE A GREAT IDEA. I’VE NEVER DONE COMPOSTING BEFORE. 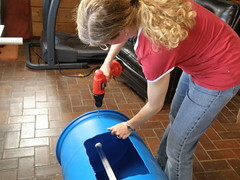 DO YOU NEED TO PUT A FEW HOLES IN THE BARREL FOR AIRFLO? I NOTICED SOME OF THE COMMERCIAL ONES HAVE HOLES AND SOME DON’T. We don’t put holes in ours. We did at first, but discovered that in Oklahoma we have more of a problem with it being too dry rather than too wet. Our wind really dries everything out. I would go without holes and you can always add them if you need to. 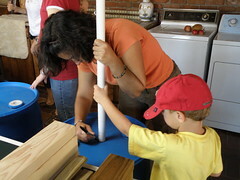 Good luck composting!